Discussion in 'The Suggestion Box' started by HazardousCode, Mar 12, 2019. I would like to propose allowing all players to bid in the Supporter Auctions. This would promote more activity, and allow supporters who host auctions to benefit from greater participation. Notice that (without including last week's auction) there hasn't been an auction for 6 months. This is a fairly regular pattern. 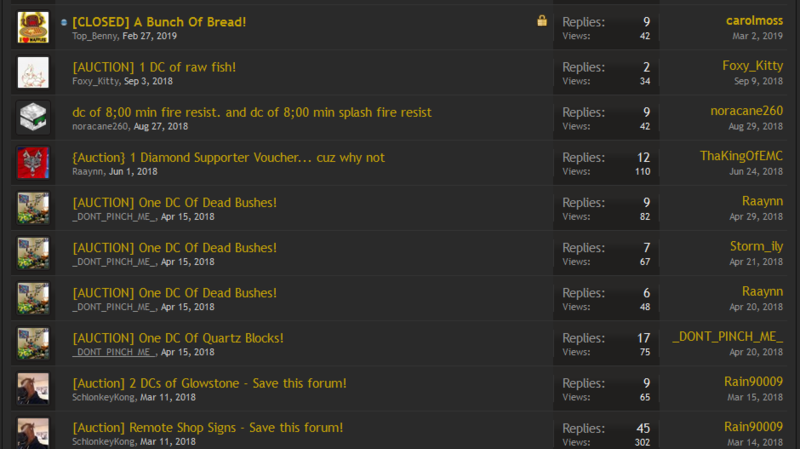 I myself would host more auctions if this section of the forums were more active. At the moment, most threads only get three or less participants. This lack of participation makes the forum obsolete; there's no point, because the items don't go for as high as they would in the general auctions. I'd also find myself participating in more auctions. I'm sure other members of the community will agree that they would host more auctions simultaneously if the supporter auctions weren't so dried up. I've had this thought for a while, but haven't until recently been a supporter to be able to support the theory. Do your thing EMC, and discuss! LordKopecz, FadedMartian, Tuqueque and 6 others like this. I think that the supporter auctions should be removed entirely. It's just not needed and in the end, you will loose money to the lesser exposure of your auction thread. If your only going for a demographic of just supporters, it might just be best to have a trade sale. Picklez27, rykly18, FadedMartian and 6 others like this. I agree. If you allowed all players to bid on supporter auctions, then there would basically be two auction houses, and that'd be weird. I believe that the support auction houses be removed entirely due to inactivity. I like this idea. You could also just change the rules so that supporters can host 5 or 6 auctions in the regular auction section, but I think that that'd require more moderation to make players understand than just changing the permission settings for "view" and "reply" on the supporter auction section. EDIT: perhaps, following my idea, we could rename the section to "Supporter hosted auctions" to reduce confusion. Starsphere, NuclearBobomb, Nickblockmaster and 3 others like this. Good idea, but I think 5 or 6 is too much. I think 2 or 3 would be good though. But I like the idea of hosting an auction where less people can see it. I'm afraid that this will get removed now... I think I should start an auction soon. I like this extension- it creates less confusion (for the most part), brings the participation, and puts everything in one easy to access spot. I believe this is where the 5 or 6 suggestion came from. Personally, I like the idea of 5 or 6. I'd LOVE to see that. I would be able to make use of that many auction slots. May I ask why you see that as too many? Stnywitness and TomvanWijnen like this. No official "+1"s or "-1"s yet. What do you guys think? Now's your chance to weigh in! NuclearBobomb, Stnywitness and FadedMartian like this. But you have been a supporter many times! Tbird1128, HazardousCode, NuclearBobomb and 1 other person like this. Yessssss to the idea that supporters can host multiple auctions in the regular auction section. That'd be perfect! I feel this is something that I have been hoping that would change because they don't get much attention and it leaves out the player part for it leaves a vast majority out of auctions. If they did this however I believe not only would this be used anymore but it brings back a little more attention to auctions. HazardousCode and Starsphere like this. Yes I agree that the supporter auctions don't get as much exposure, so removing them wouldn't really change much other than supporters loosing their ability to post multiple auctions. As a counter-balance to that, I would say possibly increasing the amount of active auctions for ALL players to either 2 or 3 would be a good middle ground. Disclaimer: No, you don't have to agree with me entirely, or at all for that matter, this is just a personal opinion. I agree with this suggestion. This idea stays true to the fact that it is a supporter perk, while it also makes it so we don't have a parallel market because the demand and supply within the supporter community might be different than that of the regular auctions.